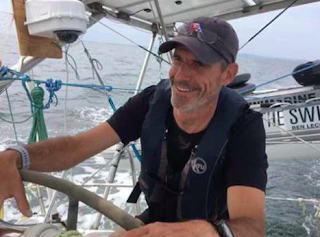 "[It is] such a good feeling to be back out on the ocean and heading back to my last GPS location to dive right back in and continue The Swim across the Pacific Ocean," wrote Ben Lecomte. Tropical Storm Maliksi finally passed across the course of his 8,721 km transoceanic stage swim across the Pacific Ocean between Japan and California. "The weather report we all had been waiting for came in this morning. Maliksi, the low-pressure system that had forced us to retreat to land was finally moving to the east and gave us a clear weather window to sail back to our location. Our router estimated we could leave Yokohama by the end of the day or early Wednesday morning. This was our last 24 hours on land. I took with me my phone and broken laptop to find a WiFi connection. A few days ago a heavy toolbox that wasn’t secured properly fell on my backpack. Its thin foam liner wasn’t enough protection to softened the impact, more than half of my screen cracked and I was left with only the right side. The black space had been creeping up leaving me with less and less working space each time I used it. Fortunately, I was able to retrieve my important files and could still use it to send out some emails. I spent my last day just doing that and calling and video conferencing my friends and family one last time from land. Never before had I spent that much time. I was looking at every detail of people’s face, I wanted to have a clear memory of them and remember how the light bounces off their cheecks when they were in a darker place or how their air shined under the sun. These moments were intense and I felt deeply connected. In the evening before going to bed I rearranged my personal items to make sure that everything was at its place and I knew where everything was. I can’t stand spending time looking for something that has been misplaced. I share a cabin with Lauren and Paul and each of us have two shelves. Paul makes very good use of his shelves, there is no more empty space! He has invaded the floor with a big backpack full of clothes plus whatever other items laying on the floor. God, I love my nephew, that’s why I can tolerate his mess. I went to bed excited about going back on the ocean and thinking about the next low pressure that would be on us in few days. This time we wouldn’t be able to seek for cover on land, we have to ride it..."
Lecomte's live tracker can be seen here and a Facebook link is here.